QuickBooks helps you manage your small business’ billing and accounting, but with the help of Smart Service, it can do so much more. The septic tank service software Smart Service integrates with QuickBooks to give you the power to schedule, dispatch, plan routes, manage technicians, and deploy work order information to your crews. Suddenly managing your septic tank service operations is as easy as pushing a button. Smart Service is a QuickBooks add-on, meaning it will fully integrate with all your existing customer data. No messy transfers or lost leads; you can start scheduling jobs as soon as Smart Service is set up! 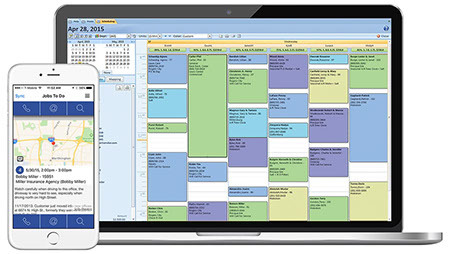 Pull up the weekly calendar to see all of your current jobs, crews, and availabilities. After that, simply click and highlight any open space and begin typing your customer’s name. That’s it! Smart Service picks it up from there. The address, work history, and any notes will show up with one, easy click. Smart Service is the septic tank service software for QuickBooks, it’s as simple as that. With Smart Service, dispatching no longer includes sifting through cabinets for customer information, double booking your crews, or making repeat phone calls to set appointments. Seeing who is available and who’s on a job is easy on the scheduling page. Simply insert a new job into an active technician’s schedule and Smart Service does the rest. All existing customer information, work history, installed equipment, and any other pertinent data will be pulled up and immediately sent to your technician via the Smart Service mobile app. From there your technician can call and confirm the appointment to let the customer know they’re on their way! Smart Service allows your crews and your office to stay connected like never before. Using the Smart Service mobile field service app to send updated or new work information directly to your technicians is as easy as liking a photo on Facebook. One click and customer information, ideal routes, and real time updates are all available. All the techs need to do is check their mobile device. With the Smart Service mobile app, your technicians can also update job progress, add line items for any services rendered, and collect customer signatures. The system sends job progress and completed paperwork back to Smart Service which creates a ready-to-bill invoice right in QuickBooks! This septic tank service software ensures your billing stays accurate and remains comprehensive for all services rendered. Smart Service is a fully integrated software add-on for QuickBooks that can optimize scheduling, dispatching, routing, billing, and more! Request your free demo of Smart Service today! Own the septic tank business with these tips!